Spring and summer are the best time to go vegetable shopping in America. Farmer’s markets across the country come to life with the harvest of local farms – fresh tomatoes, peppers, squashes – green and yellow and bundles of greens. These outdoor markets last well into the fall (autumn), until it starts turning cold and the first frost of the season begins to appear. A walk through the stands of a farmer’s market or well stocked produce aisles in a grocery store is the best pick me up for me. It works wonders to raise my spirits and reminds me of trips during my childhood to local produce markets called Mandis. Our father would enlist my brother and I to accompany him on his weekend trip to buy fruits, vegetables and herbs for the coming week or ten days. A mandi in any Indian town or city is a place where both, wholesalers and retail hawkers do business. So, from an individual purchasing for one household to a person fulfilling a large order for a business, everyone can be found heckling and rubbing shoulders in the same marketplace. Like most markets in the country, a mandi is also full of smells, sounds, sights, textures and of course flavours. Local produce/farmers’ markets such as Pike Place Market in Seattle, are the only commercial spaces that come close to replicating the experience of a mandi. That’s why I feel instantly energized when I see and interact with farmers showcasing their harvest at spring or summer time markets. Boston has two such markets – one at Copley Square and the other at Haymarket – that host a variety of vendors selling fresh produce, baked goods, cooked food as well as flowers; everything one would need to set a pretty table. One of my favourite vegetables is the Zucchini. I did not know of it until I started living in the US. The first time I picked up Zucchini was to use it as a replacement for lauki (bottle gourd), to use in a dal cooked with split chickpeas and chunky lauki. 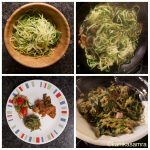 After that first time, I found myself buying zucchini frequently and started cooking it as a side dish for a variety of meals. Noodles with zucchini, or zoodles, is one new way in which we have started using this vegetable. There was a sudden spike in spiralizing vegetables and the produce aisle now always has a stock of spiralized squashes as well as carrots. I haven’t spiralized carrots yet, but have used thin, long slices in a chicken noodle soup. But, in the meantime if you want to explore another squash which is suspiciously like spaghetti – check out our recipe here for the Spaghetti Squash Linguine. Now, let’s get on with the zoodles, that you can make without any fancy tools, promise. Inactive: 15 minutes, Active: 15 minutes. Basil, fresh: 8 to 10 leaves, dried ~ 1 tsp. 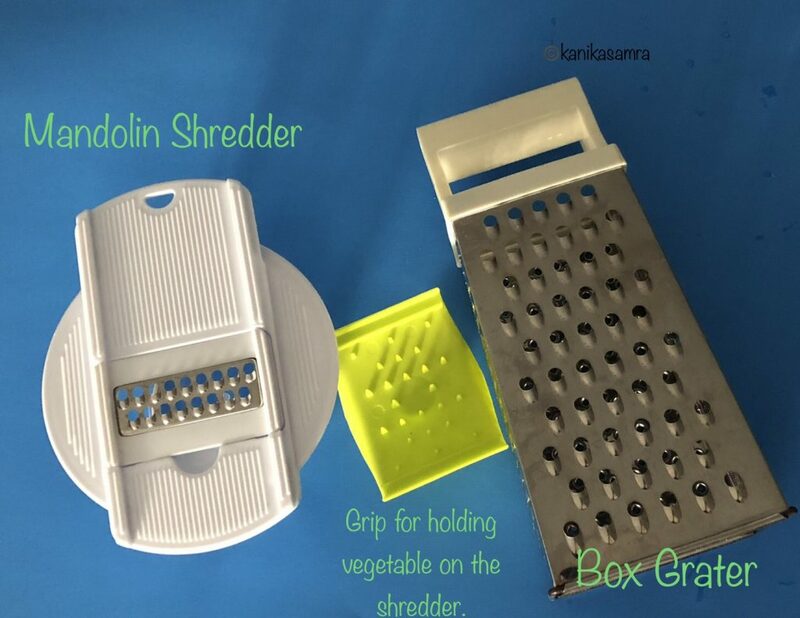 A grater or a chopper with the slicer/spiralizer attachment. Cooking utensils – a pan and tongs or spatula for manipulating food while cooking. 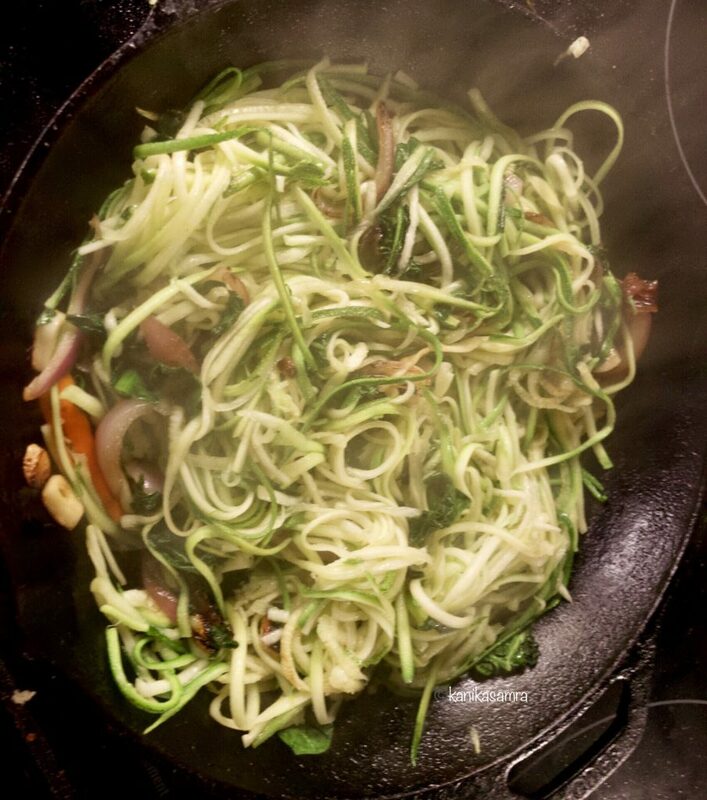 Spiralized zucchini in the pan. Wash and pat dry the zucchini. For two people, one large zucchini will suffice. If unsure, use more. 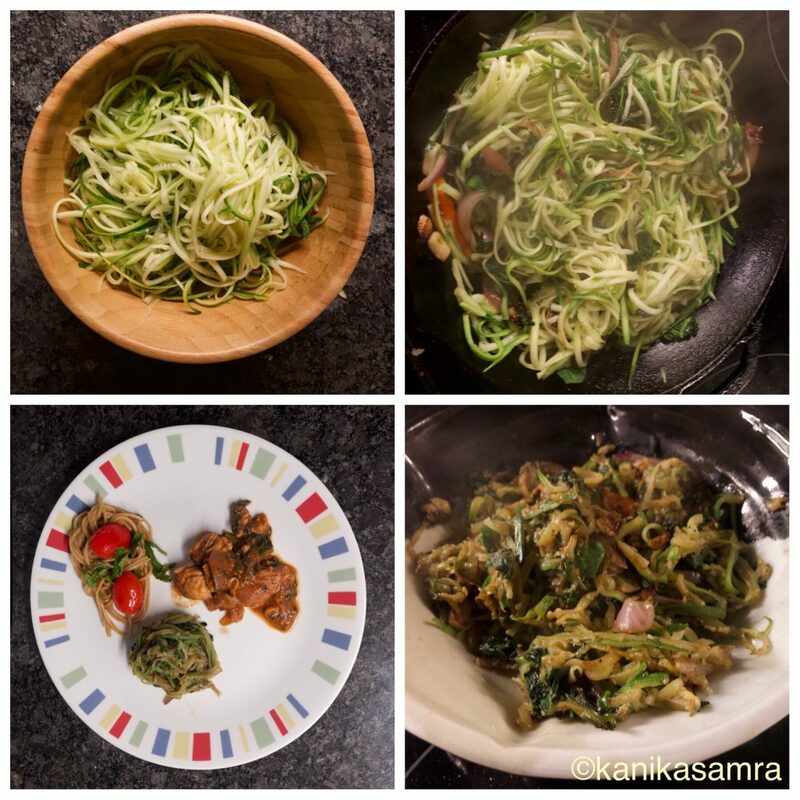 Be aware that zucchini has high water content, and cooking will evaporate some of it, shrinking the zoodles in size. If you have a box grater, use it to grate the zucchini into long strands. Don’t fret if they break off and give you strands that are only half as long as the zucchini. Another way to make the noodles is to use a mandolin shredder with the right attachment. I have used both and can attest to their efficiency. After the zucchini, turn your attend to prepping other ingredients – peel and slice onion, peel and chop garlic and, wash and finely chop tomatoes. If using fresh herbs like basil and oregano (in the spring, I typically have some), wash and pat them dry. Remove leaves from the stalks and then roll and chop, finely. Put a pan on the stove on high heat. I used my cast iron skillet. Once it seems hot, reduce heat to medium high and add oil. I always heat the pan first and then add oil. A nifty tip that I saw on an episode of the Barefoot Contessa where Ina Garten advised that to avoid food from sticking to the cooking vessel, heat the vessel first and then add oil instead of heating oil in a cold utensil. Since then, that’s what I’ve done and hardly ever have been disappointed. To the oil, add garlic and onions. Saute on medium high until garlic turns golden brown and the onion slices seem translucent. Then add tomatoes. Cook for a few minutes until tomatoes are soft and mushy. Add salt, pepper and red chilli powder. 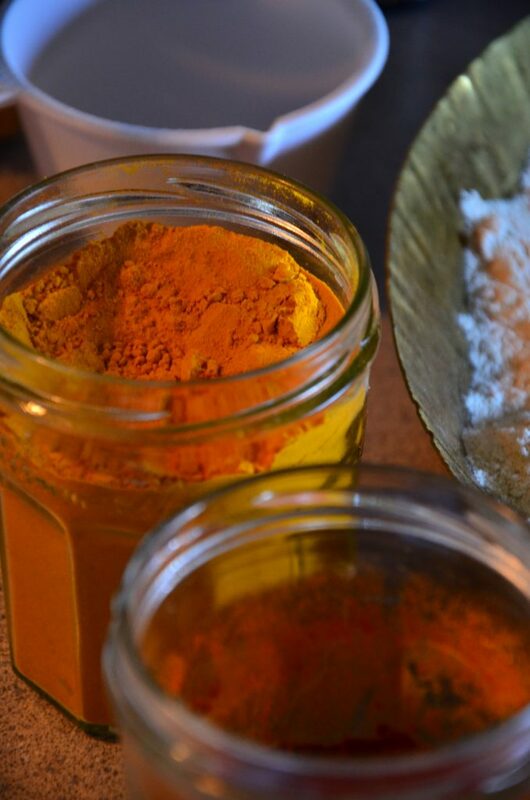 You can skip the chilli powder based on your preference. Mix well to coat the onions and tomatoes evenly. *Note: To add some more nutrition to this veggie pasta, add chopped spinach at this point and cook for another 2 minutes, until it is blanched and almost cooked. If not, proceed to adding zucchini. Tip in the zucchini to the pan. Turn the heat up to high and cook, stirring for 2-3 minutes. The idea is to cook on high heat to allow moisture to escape so that the zoodles do not become too soggy. Add basil and oregano at the end and toss once before plating. 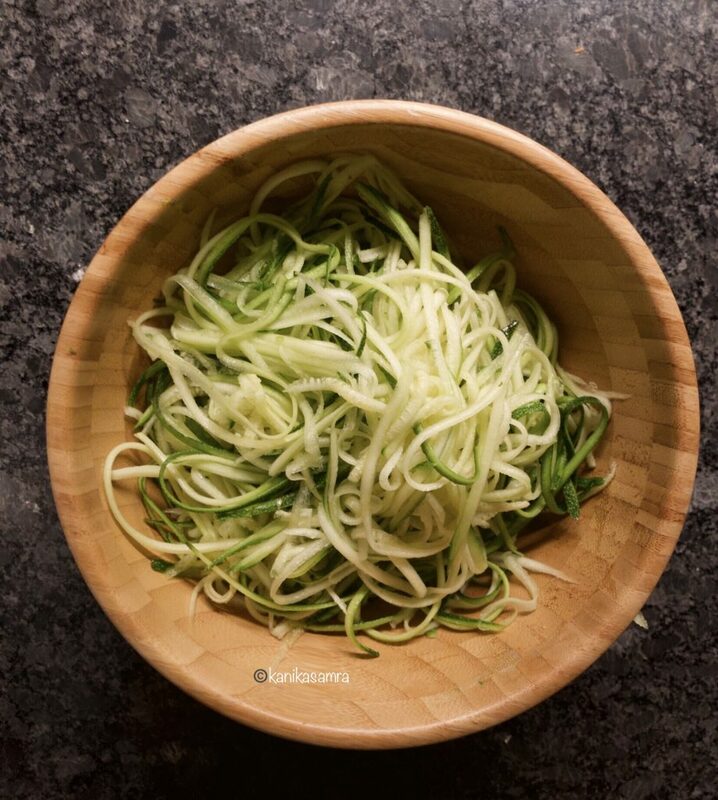 Healthy, vegetarian and vegan Zucchini Noodles are ready! Basil- fresh: 8 to 10 leaves, dried ~ 1 tsp. Wash and pat dry the zucchini. If you have a counter top grater/mandolin shredder use it to grate the zucchini into long strands. Prepping other ingredients – peel and slice onion, peel and chop garlic and, wash and finely chop tomatoes. If using fresh herbs like basil and oregano - wash and pat them dry. Remove leaves from the stalks and then roll and chop, finely. Put a pan on the stove on high heat and then add oil. To the oil, add garlic and onions. Saute on medium high until garlic turns golden brown and the onion slices seem translucent. Then add tomatoes. Cook for a few minutes until tomatoes are soft and mushy. Add salt, pepper and red chilli powder. Mix well to coat the onions and tomatoes evenly. Add chopped spinach at this point and cook for another 2 minutes, until it is blanched and almost cooked. Tip in the zucchini to the pan. Turn the heat up to high and cook, stirring for 2-3 minutes. Add basil and oregano at the end and toss once before plating. To add some more nutrition to this veggie pasta, add chopped spinach at this point and cook for another 2 minutes, until it is blanched and almost cooked. If not, proceed to adding zucchini.